At Starkey Hearing Technologies, we have over 30 years experience delivering first-class earmould products. Our core values of quality, service and innovation have earned us a reputation as the industry leaders in earmould manufacturing. The development of new technology never stops and neither do we. As new products enter the market place, our dedicated product innovation team are constantly researching new products and materials to ensure the latest solutions are always available to you. 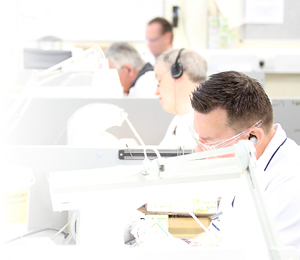 Starkey Hearing Technologies has invested heavily in digital processing, we manufacture moulds using state-of-the-art technology in both hard and soft material options. A faster response and no new impressions required if a mould is lost or damaged. Finer, more detailed moulds than could be achieved by hand drilling. A light curing non-allergenic material, specifically developed for Starkey’s Ear Imaging Viper SLA fabrication process. This revolutionary approach to earmould fabrication utilises advanced CAD modelling software and hardware within the manufacturing process, providing styling and vent options previously considered impossible. Due to the high temperature used during the laser curing process, this material offers a minimal risk of skin sensitivity or allergy. Silicone is a soft, durable and non-allergenic material available in a wide variety of colours. Silicones offer superior acoustic sealing properties and are suitable for severe to profound hearing losses. Silicone materials offer minimum risk of allergy or skin sensitivity. 60 – Firm - similar to the legacy products of Bioplast and Soft Acrylic. We are producing matt finish earmoulds as these are accurate reproductions of the impressions with no additional layer of coating on them. The matt finish is very cosmetically appealing in use as it does not catch the light and also improves the grip of the product in the ear. Whilst traditionally produced soft acrylic products remain available there has been a trend towards the use of silicone materials. Silicone is more robust and long lasting. Soft Acrylic hardens and discolours quickly when worn, due to being very porous. 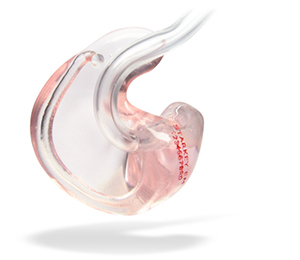 Silicone earmoulds have a reduced risk of sensitivity reactions. If you have been using a Soft Acrylic material, we would suggest you request a firm flexibility of a 60 soft silicone earmould as an alternative superior product.